The trajectory of a life path is rarely a straight line. A new medium or process doesn’t come along often. In the mid-1990s, due to unforeseen circumstances, I found myself between college teaching jobs. While I was considering my next step, I happened to start thinking about the artwork of an acquaintance, Dorothy Furlong Gardner. 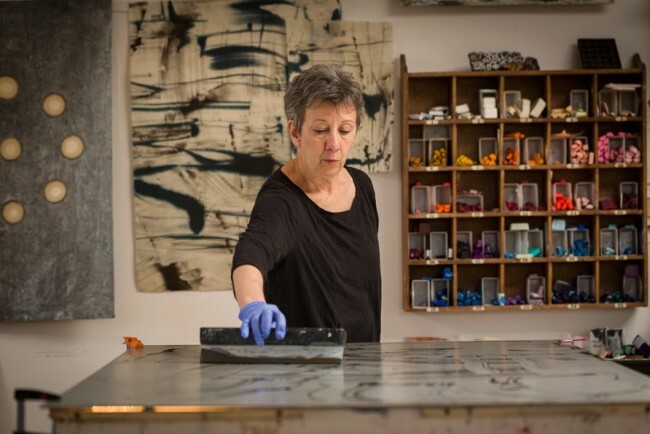 A printmaker in the early 1980s, Dorothy had developed encaustic monotype printing as a way to free up her art practice. I was fascinated by its immediacy and the fact that it didn’t require a press. 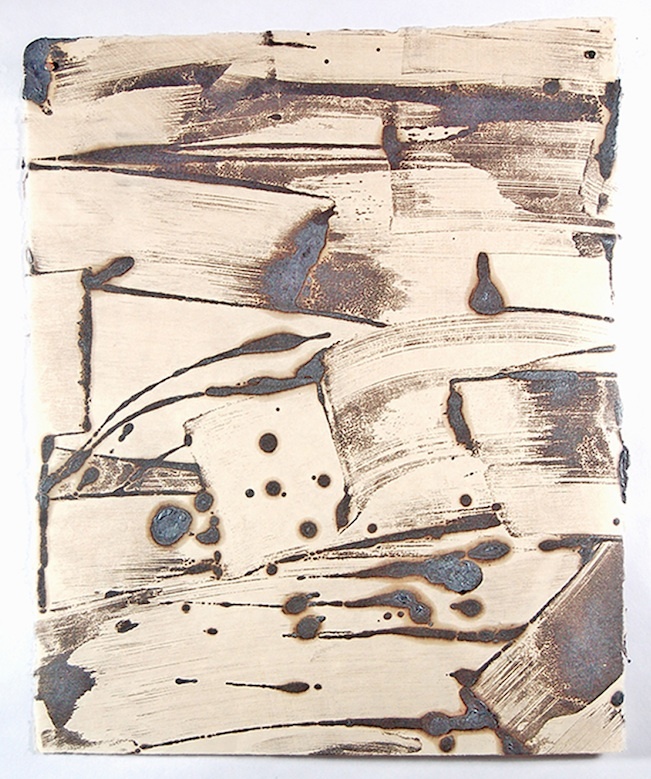 Instead, printmaking with encaustic (beeswax, damar resin and pigment) requires heat to melt the paint, so that it can be absorbed into the paper. Recognizing the inherent beauty of the (then) little-known process, I took a break from job hunting and set out to build on Gardner’s initial research. 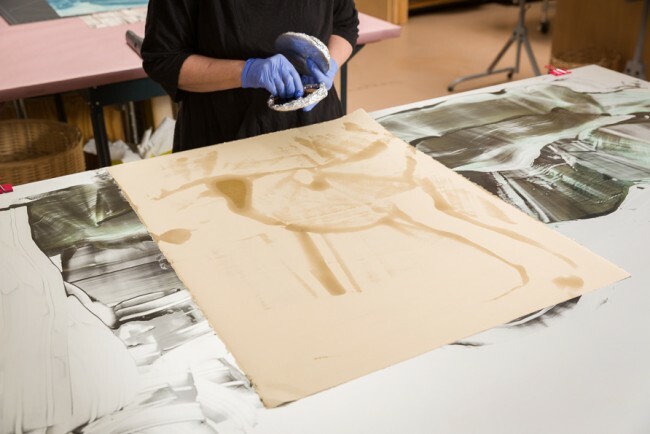 A monotype is a one-of-a-kind print, essentially a painting done on a printing plate and transferred to paper. Each piece begins anew or builds on the residual ghost image left on the plate after the last printing. Monotypes are usually made with oil or water-based inks. 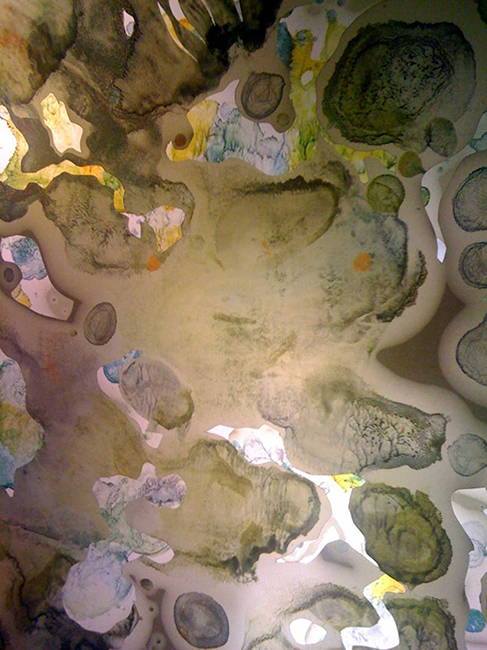 With encaustic monotype, pigmented wax is applied directly to a temperature-controlled metal plate by painting or pouring it onto the plate, or more commonly, drawing on it with encaustic in solid stick form. The molten paint can then be manipulated with brushes and other tools to refine the image. 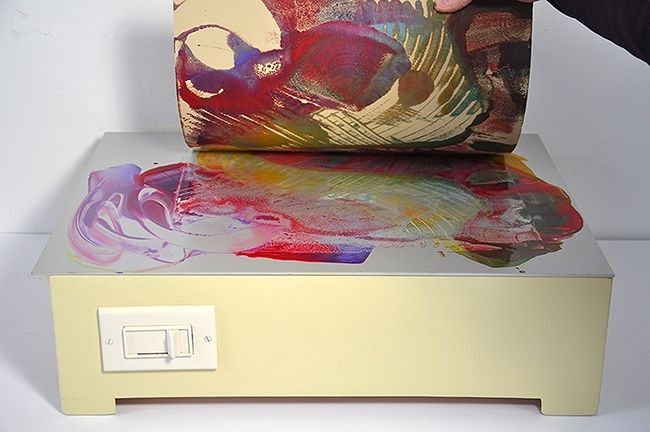 To create the print, absorbent paper is laid on the plate so the image transfers onto — actually absorbs into – it. Fabrics may be used as well. A hand-held Japanese printmaking tool called a baren may be used to gently press the print and bring it into full contact with the plate. Monotypes are compelling because of their immediacy and the intimacy of the artist’s touch. Encaustic monotypes have an enhanced material quality; they can capture a calligraphic mark with the poignant resonance of a haiku. A multi-pass (layered) print may yield depth, translucency and complex color. Through trial and error over several months, I taught myself to print monotypes with encaustic. I quickly learned that it’s not as easy as it looks. The process presents a double-edged sword, so to speak; one side being spontaneous, fun, intriguing, full of unplanned results that inspire new ideas – and the other a set of complex variables, including pigment-to-wax ratios, types and thickness of paper and variations in temperature that could quickly turn the print into a hot and waxy mess. I often work in series and I needed to be able to predict and (loosely) repeat outcomes in order to create related works. But I also understood that the encaustic’s free and fluid aspects were its strength and that too much control could make the work look stiff and stilted. I therefore adopted a Zen approach: Be in the moment, pay attention to what’s happening – and let go of attachment to outcome. 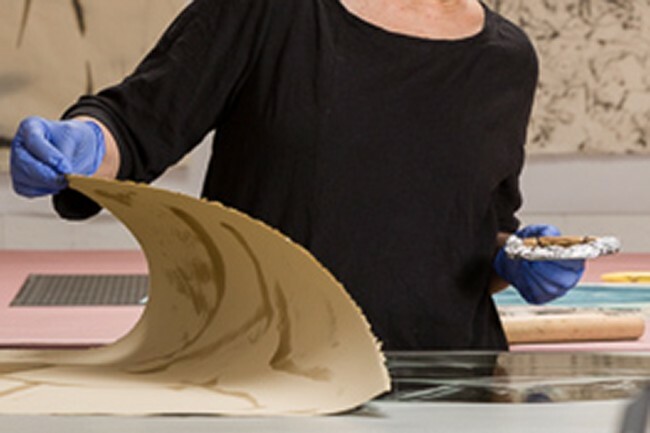 With experience, encaustic printing proceeds intuitively. 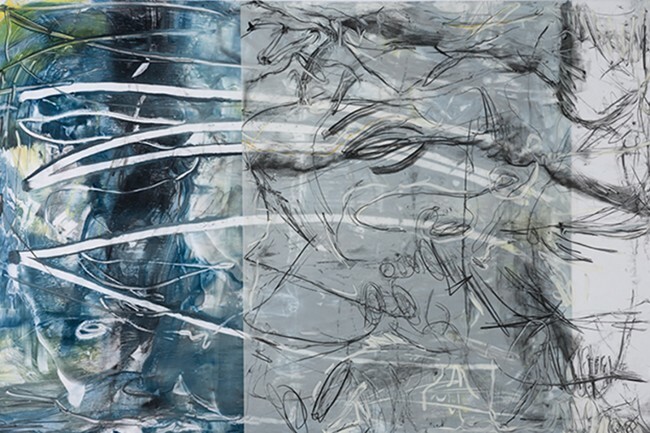 An artist working in encaustic monotype learns to improvise, responding to the molten wax, adjusting body movements, constantly assessing the heat and other variables to guide – but not determine – the outcome. I had no particular affinity for printmaking before I began working in encaustic monotype. I was trained as a painter; my works typically consisted of painting, drawing and installation art. What inspired me to persevere were the medium’s seemingly limitless possibilities. The mercurial aspects of the molten wax itself supported my interests in natural forces, systems and the sciences that illuminate them. Through research and experimentation, I learned that wax strengthens and seals paper. This enhanced strength and durability opened possibilities of working large or 3-dimensionally. Wax also renders paper translucent, allowing the transmission of light. 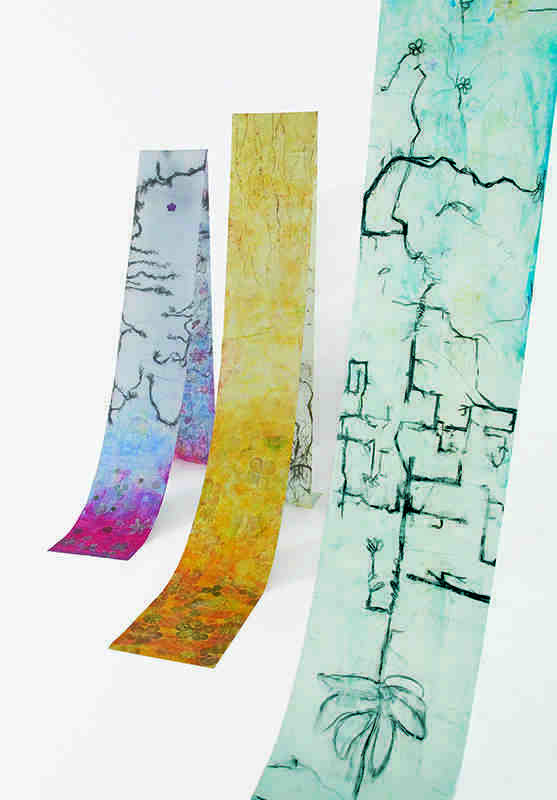 Plain or colored wax on paper (or fabric) combines well with inks and water-media, which resist the wax and create intriguing textures. Finally, I loved the discovery that if I heated a print from the reverse side, I could work back into its waxy surface with drawing media such as graphite, charcoal, and oil pastel, and these marks would remain “fixed” when cool. After several months of experimentation, I had to decide if I would re-enter academia, or strike out on my own path. I chose the latter, surprising myself and others who knew me. I wanted to be in charge of my life – without institutional interference. A risky path for sure, but I am still following it 18 years later. That doesn’t mean I stopped teaching. With 20 years of teaching experience, an MFA in painting/sculpture, undergraduate and graduate coursework in education, awards – and a hefty exhibition resume spanning more than 15 years, I was well qualified to develop a curriculum to teach encaustic monotype. It seemed feasible to teach workshops because I live in Santa Fe, New Mexico, a city with a huge population of artists. I thought the workshop teaching would be temporary: once interest from local artists had been met, demand would wane. However, my timing turned out to be very good. Within a few years, encaustic painting had become the new hot thing. I got a website. Artists from around the globe began attending my workshops and clamoring for longer classes. They also started asking for the equipment that would allow them to continue printing in their own studios. Thus began another foray into business: manufacturing the Roland Encaustic HOTbox. I needed equipment that was inexpensive and easy to transport that did not use much electricity. For my own work and teaching I had long since modified the “stove” that Dorothy had used — a welded steel box with light bulbs as a heat source — to make it lightweight and insulated. I added an anodized aluminum printing plate so that the pigment colors would not react with the metal. Now that I was selling the HOTbox, accommodating the needs of professional artists was a primary concern. I made the equipment modular so that it could be used singly or in groups with a larger plate, enabling the use of large sheets of paper. I affixed a side bar so that paper could clamp to it and be “registered”. The printing plate surfaces range from 16” x 22” (single), 22” x 32” (double) to the Pro model with a 32” x 44” plate. I named this creative tool HOTbox because I thought it was catchy and straightforward. The Roland HOTbox™ and instructional 2.5 hour DVD, Encaustic Monotypes: Painterly Prints With Heat and Wax, are available at www.RolandWorkshops.com which features my workshops and products. DVD is also available through Amazon. International orders for DVDs can be made through Zijdelings. 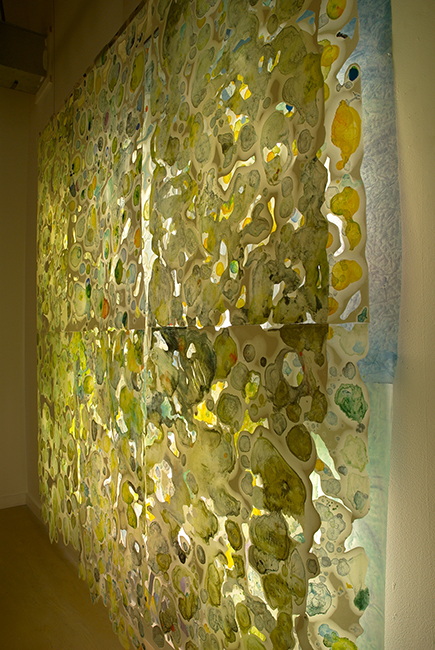 My early works included installations of 35-foot-long scrolls; heated encaustic and mixed-media drawings; multi-part print installations; translucent and multi-layered prints; and prints combined with encaustic paintings on panel. These pieces led to cut-paper installation works and path-breaking ways of exhibiting the works, including back-lit monotype installations and, most recently, video projection on a large-scale print image. I am committed to sharing my technical and aesthetic explorations and discoveries with students and other makers while I continue to devise original ways to incorporate encaustic monotype to express artistic concerns that expand the definition of printmaking. Paula Roland lives and teaches in Santa Fe, New Mexico. She exhibits at William Siegal Ancient Contemporary Gallery (Santa Fe), Conrad Wilde Gallery, (Tucson, AZ) and Smink, Inc (Dallas, TX). 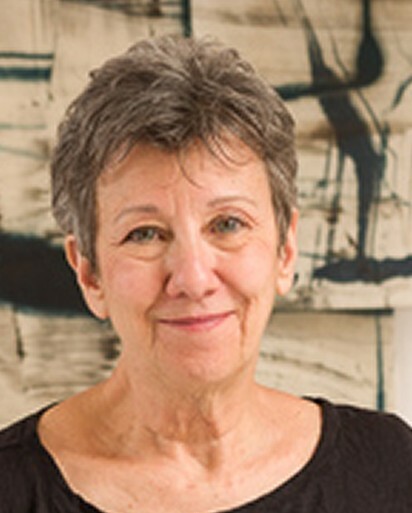 Her work is widely exhibited and collected in the US and abroad. She has been the recipient of many awards, including one from National Endowment for the Arts. 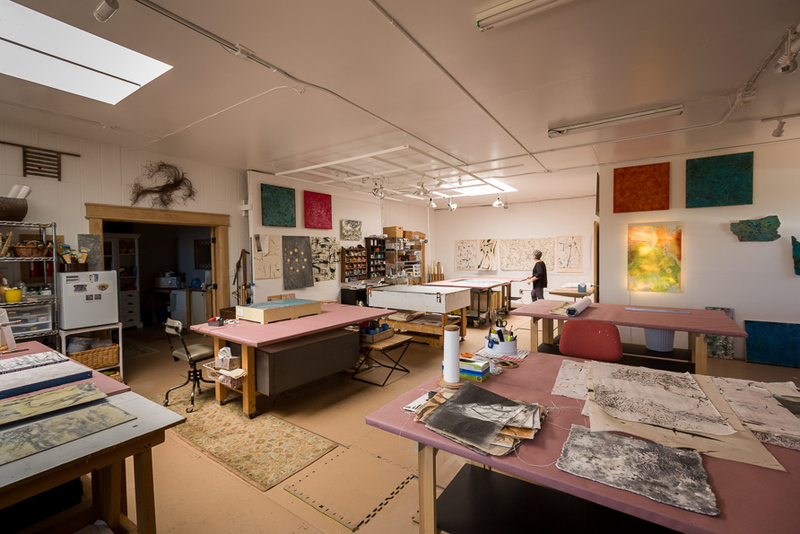 Roland has taught encaustic throughout the U.S. and in Italy and France, while also offering the first (and perhaps only) college course in encaustic printmaking. 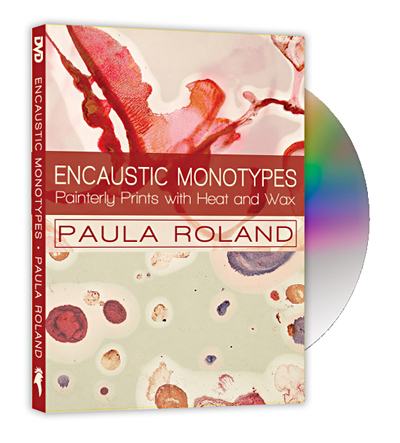 Her instructional DVD, Encaustic Monotypes: Painterly Prints With Heat and Wax, has sold well over 1000 copies. View her work and exhibition schedule at www.PaulaRoland.com. I have done this in experimenting with encaustic and I find that doing it as a monopty[e on fabric or paper and sometimes pellon was very satisfying to me. I will have to get your book. I haven't done it in a while.Theone problem with encaustic is that the waxes are so expensive. I have made some with oil pastels and the mixed wax, but the colors are not as brilliant. Love the work on this site. Dina O'Sullivan, friend of Susie Ranager. Dina, I am so glad you enjoyed the process! What people don't realize is that we use very little encaustic when printing. Also, the colors are very concentrated and can be diluted/extended with beeswax or encaustic medium (beeswax and resin), especially when painting with it. Most manufacturers are now making smaller bars of encaustic, so you could purchase a few for much the same or less than tube oil or acrylic paint colors, and create many new colors from them. Do this by melting in small tins on an electric griddle or Roland HOTbox, and blending them yourself. Then pour into a mini cupcake mold or another small tin. Put them in the freezer and they will slightly shrink and pop out. I am so glad that you like (love!) my work. Please get a good book on encaustic and read about health and safety (Joanne Mattera's is a good start, and there are many others.) My DVD, Encaustic Monotypes: Painterly Prints With Heat and Wax, has extensive info on this and much other important info on encaustic. Unfortunately I don't have a book, but may be producing a 2nd DVD this winter! Paula, I am so very proud of you! You've done well, building on Dottie's original work. I remember making a Robert Gordy-like monotype in her studio waaaaay back. I still love it. Congratulations and many wishes for your continued success. Big hugs. Thanks Darlene. Dottie, (Dorothy Gardner) did something many of us do, i.e., explore in our studios in much the way a scientist would. It has made many artists happy! Paula, what a great article!! Your path through life has been inspiring to read about and beautiful to witness. Thank you for sharing your journey! Thanks so much, Diane, for your kind words. Paula, I couldn't be more pleased! You've done just what I had expressed in Daniel Smith's "Inksmith" when my technique was first published by him so long ago: that each artist who tried my process would add to it their own voice with new and different variations on the basic technique and then share them with others. Incidentally, I did use an insulated wooden "stove" as well as my metal one, but you have improved on my original design with a higher, thus safer heat box. The old metal heating plate did double duty as a warming source for etching plates for grounding and printing, but I left it behind in Louisiana along with my old printing press when I moved to Oregon in the spring. Please keep sharing your rich talent and your excellent teaching in workshops. Isn't it wonderful that so many artists have finally discovered pigmented wax art? And thanks to our many suppliers, we have unlimited materials and other resources to expand the medium. Thank you Dottie, for your kind words and your inquisitive mind. Your discoveries have made many artists very very happy. Paula, I couldn't be more pleased! You've done just what I had expressed in Daniel Smith's "Inksmith" when my technique was first published by him so long ago: that each artist who tried my process would add to it their own voice with new and different variations on the basic technique and then share them with others. Incidentally, I did use an insulated wooden "stove" as well as my metal one, but you have improved on my original design with a higher, thus safer heat box. Please keep sharing your rich talent and your excellent teaching in workshops. Isn't it wonderful that so many artists have finally discovered pigmented wax art? And thanks to our many suppliers, we have unlimited materials and other resources to expand the medium. Thank you for sharing your journey, Paula. You've expanded the creative process for so many of your students, and I feel lucky to have studied with you. Love your Zen approach too! You are such a sweetie! Thanks--it does my heart well to see your successes. Fantastic work and philosophy! You mention this can be applied to fiber. I work a lot on silk. Could something like this be successful on silk? Thanks so much Ellen. I think it could be successful on silk. Of course that depends on what your goals are with it. Congrats on being featured here Paula, very impressive! What a lovely article...it was enjoyable to read about your teaching, process and work. Loved seeing photos of your wonderful work...hadn't seen the scroll-like pieces. Thank you Christine, I had a good time writing this as well. Glad you like it! Paula, This is a fantastic article about you, your work and your journey. Congratulations. Thank you SDA for giving a voice to Paula Roland's story!! The very title of this article is one that very much resonates with me!! That moment when Deanna Bradley Wood showed me encaustic monotype at her studio in Denton, after she saw Paula at the conference, was a turning point for me. I felt like a fish taking to water. It allows me to be spontaneous, to create in the moment, with a range of mark making that is diverse, just like the many moments in life. I treasure this way of expressing myself and creating. And I am so grateful for all the steps that brought you to this process Paula Roland. Your sharing of this process means more seeds of possibility taking hold in others, like me. With much gratitude. Karen Chaussabel, thanks for the kind remarks. Thanks to SDA, the Encaustic Conference, Deanna Bradley Wood, Dorothy Furlong Gardner, and many others as well for the opportunities I've had and can pass along. I follow you on FB and watch your video over and over, learning something I missed with the first view. Thus, I enjoyed this article. I purchased your Hot Box and am pleased with it. I do have a question. In this article, you again talk about your beautiful scrolls (which I am into) and hanging pieces. Can you tell us how best to hang the long scrolls and also tell us what you use for your back lighting? Thank you so much for all I have learned - you have inspired so many of us. Shirley, Thanks so much for your kind comments! To answer one question, I use daylight fluorescent light fixtures affixed to the wall behind the back lit piece. You could also use leds but they may not be bright enough. These lights are both "cool" in temperature. About the hanging apparatus, there is no one solution. I sometimes use very strong very small magnets to hold the work against nail or screw head in the wall, or a steel strip. Another option is to fabricate a clamp from two pieces of metal or two plexi bars screwed together with the paper between them. I hope this helps. It's really a lot of trial and error to come up with the best solution to each piece. Hi Paula, Your work speaks to me on so many levels and I would love to do one of your workshops but unfortunately I live in England and there are no workshops available that demonstrate the same quality of work in this country. I have ordered your DVD but I wonder if you might ever consider coming to the UK? The other difficulty of course is getting hold of one your HOTBOXES and I wonder if you have any suggestions in this regard. I find myself in a place where I have a real fear of starting to make art again but I always loved the idea of spontaneity in art and being in the moment that mono printing offers so having watched your video today on YouTube I am going to my studio to make a start! But I look forward to receiving your DVD in due course. Thank you for posting your wonderful videos on YouTube too - they feel so honest and real. Paula, I took your workshop maybe 4 years ago (I lose track of time these days) and worked very hard for quite a while, creating dozens of prints that I matted and showed in clear envelopes, many 8' scrolls and an installation that I showed quite successfully. I also printed individual hanging "scrolls" on fabric. I have quite a few scrolls on metal and use strong magnets to hang them. However, I find that people prefer to purchase framed prints, ready to go. I do not have storage space for framed (plus glass) prints. I therefore stopped doing monotypes, which is a pity since they're an exciting creative technique. How do others manage this aspect of the monotypes? Does everyone frame them? How do most people present them for sale? I have lots of good and attractive papers, two hot boxes, large plate and small but haven't touched them in a couple of years. Perhaps my questions will resonate with other Encaustic artists and they, too, ill benefit from your comments. Thanks a lot and Happy New Year! 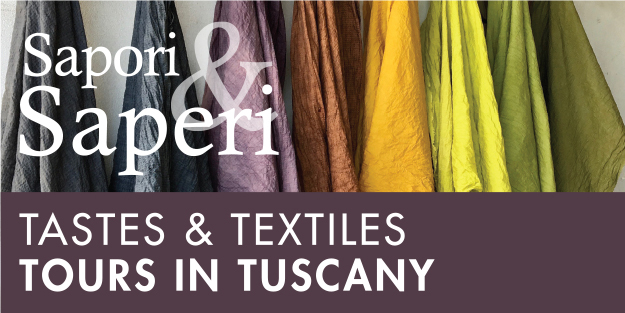 I have worked with textiles for many years professionally, but really want to experiment with this printing method. My question is how much electricity is needed for the Hot Box? (I live off-grid) and is it ridiculous to think that I can do this if I live high up in the mountains in California, where it is very very hot in the summer?